Tired of all that clutter in your office or home? 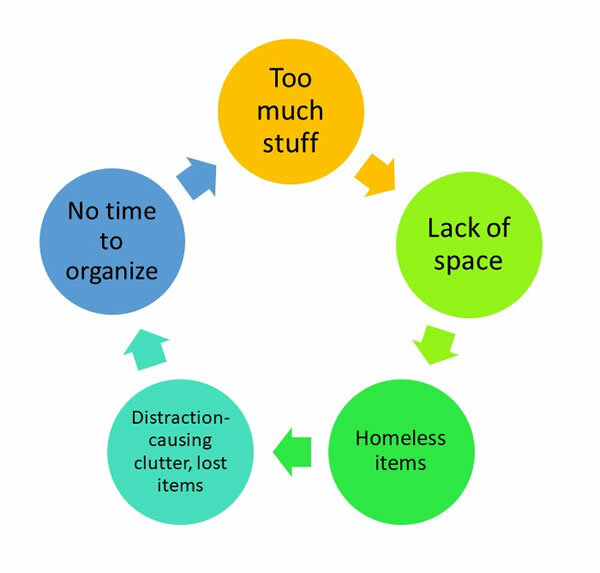 Are you stuck in a cycle of disorganization? Autumn is a great time of year to declutter and get organized! There’s a crispness in the air, a feeling of “fresh starts” as your kids head back to school. Maybe you’ll be having company during the fall and winter holidays and want your home to feel welcoming. Maybe you’ve taken a summer vacation and are ready to tackle those stacks of paper and the overflowing email inbox at the office. Is all that stuff getting in your way and making it hard to focus? Whether it’s papers, collectibles, clothes, or to-do items, many people think if only they had more space they could be more organized. But I often find it’s a matter of too much stuff or not having a home for things, rather than lack of space, that continues the cycle of disorganization. Is this you? You don’t have enough space for all your stuff, so you don’t have a “home” for everything, The result is wasted time looking for things, maybe requiring a deadline extension or even missing a deadline, becoming distracted, and sometimes wasting money buying duplicates. All of this means you don’t have the time to organize or get rid of stuff, which results in more stuff cluttering your space. Make time to get rid of the stuff you don’t need. Keep only what’s useful or beautiful to you. Make a home for those items you will keep. For papers, that means a file folder in a container such as a file drawer or desktop file holder. For clothes, that means a space in your closet where clothing isn’t crammed together. Always group similar things together so you’ll know where to put something away. An added advantage—to find something, you’ll only need to look in one spot! Put things away as you finish with them. Set aside a couple of hours, if you can, for each work session. Decide in which room to start and select a section of that room. Set up some boxes and label them: Donate, Give Away, Sell, Other Rooms. For papers, have boxes labeled: Shred, Recycle, To Do, Filing (one box per major topic such as Finances), Projects (or one box per project if appropriate). Put a large trash container in your work area. Turn off your phone. Turn up the music if that energizes you. And go to it! Important—plan a reward for yourself when you’re done.